The phone rang at precisely 8 a.m. as though right on schedule. But there was no schedule. "Hello Chris, this is John Cleese," the voice on the other end said. "I was given your number and told to call but not told when to call so I'm calling you now." A realization set in that I may be in some parallel universe sequel to "And Now For Something Completely Different." But it's hard to pass up on a chat with a comedic icon even if you're unprepared and under-caffeinated. The English actor and comedian is making his maiden trip to Alaska, mainly because Cleese does not like the cold. Not that he isn't interested in the state, but at age 77, he prefers a more climate-controlled version. "As I get older and older, I try to avoid being cold," he said. "I have friends who visit the Arctic to look at whales and I look at their photographs with great interest," he said, with his signature deadpan delivery. His initial association to the state is one made by many Outsiders, and the source of many comedians' quips – former Gov. Sarah Palin. Cleese previously theorized that his Monty Python cohort Michael Palin might have been overtaken by the mama grizzly for the title of "World's Funniest Palin." "Michael Palin assured me they're not related, but I'm not sure about that," he said. Cleese will appear for a pair of shows Thursday for what is being billed, "An Evening with John Cleese: Writer, Actor, Tall Person." He describes the show as a monologue in which he talks about his career, from Monty Python and Fawlty Towers to his work in film, followed by a question and answer session. He said he especially enjoys the Q&A, and has come to expect the unexpected, like a time in Florida when he was asked by an audience member whether the Queen really killed Princess Diana. "You never know what you're going to get asked, but we certainly haven't had too many like that," he said. But Cleese knows his audience. And to most in America, Cleese is best known for his work in Monty Python, the defining comedy troupe of both film and TV that he said became much more popular in the States than it did in his native England. "I talk about my life and being born in the war," he said. "Most of the things I talk about involve Python. I think most people are there because I've made them laugh at some point. Nobody says, 'I can't stand Cleese. Let's go buy six tickets.' They're pre-selected in that way." When confronted with the possibility that Python, along with the Beatles, may have been a standard bearer for English pop culture exported to a generation of Americans, Cleese was predictably dismissive. "It's amazing when you say it like that," he said. "It almost gives me a shiver of responsibility." Born in Weston-super-Mare in 1939, Cleese got his start writing and performing with the Cambridge Circus and at the David Frost-hosted "The Frost Report." There he began his association with other members of what would become the Python troupe. Fans of "Monty Python's Flying Circus" BBC series and ensuing films have their own favorite sketches and Cleese was often at the center of the hijinks. Cleese's portrayal of an outraged customer attempting to return a dead parrot to shopkeeper Palin is among the group's most enduring bits. Perhaps his best known Python role didn't showcase his wit, but his ability as a physical comic. Playing a bureaucrat in the Ministry of Silly Walks, he used his lanky frame to bring viewers to tears. In the mid-70s, Cleese and his then-wife Connie Booth created "Fawlty Towers," a TV show which vaulted Cleese into the stratosphere of British entertainers. He continued to act in a wide variety of roles and had maybe his greatest individual creative success in 1988 with "A Fish Called Wanda," which earned him an Academy Award nomination. "I think I don't regard comedy or humor as a separate compartment," he said. "Anything I do I approach with a certain amount of humor. It doesn't matter what subject, I tend to be creative and playful. That creative, relaxed approach is going to be humorous." The follow-up to "A Fish Called Wanda," was "Fierce Creatures," but it met with nearly none of the praise that enveloped its predecessor. "There have been some projects that have made me particularly happy," Cleese admitted. " 'The Life of Brian' was one, but 'Meaning of Life' was a terrible grind. 'A Fish Called Wanda' was an absolute delight. When we tried to do another, everyone was in a different place and we couldn't gel and you can't tell at the time (that it isn't working)." Cleese has not been shy about doling out political opinions, but is a little difficult to pin down ideologically. He's supported Barack Obama's presidency but also was in favor of Britain's move out of the European Union. "I think there was a tendency of people from the center-left to ignore some of the concerns of some people," he said. "When people see their own culture melting away they're allowed to be upset about that." 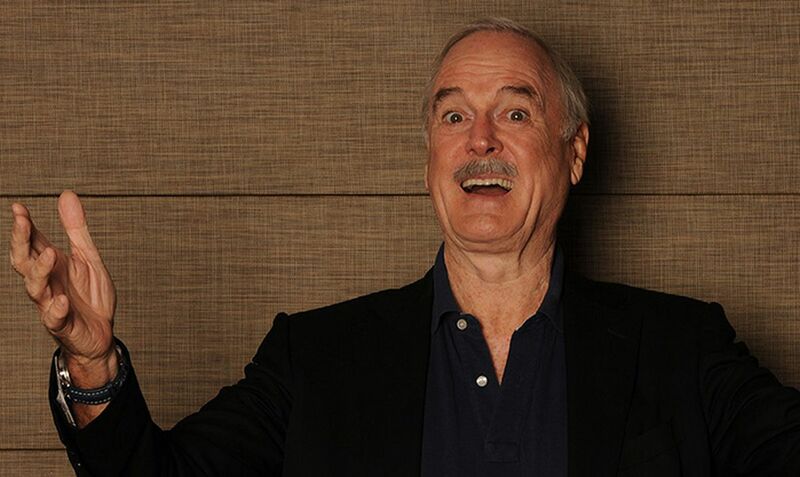 As he approaches 80, Cleese continues to stay busy. He's got a new BBC sitcom in the hopper, in which he will take an acting role, but won't write. He recently translated a French farce, "Monsieur Chasse" and may be involved in a TV series based on "A Fish Called Wanda." He is also involved in an on-again, off-again project, a film adaptation of the "The Twits," a humorous book for children. "It had fallen into great disrepair," Cleese said of the project. "It got completely screwed up by Disney." When it comes to his inaugural trip to Alaska, Cleese is excited, although he may keep his exposure to the cold to a confectionary treat. "I always thought I'd go to a restaurant to see if I could find some moose mousse," he joked. "I'm delighted to be coming." When: Thursday 5:30 p.m. and 8:30 p.m.